My husband and I celebrated the arrival of 2013 in Paris. Except for taxi rides to and from the airport, we explored Paris by foot. We stumbled upon pastry shops, ate meals that demanded more walking, and drank cups of coffee and wine while resting our feet in bistros. 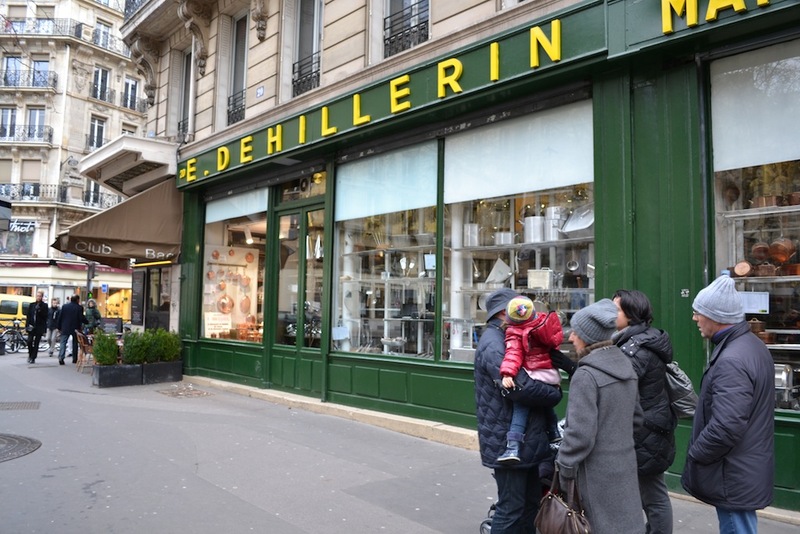 On our last day in Paris, being good tourists, we shopped and our first stop was to famed cookware store Dehillerin in Les Halles. Established in 1820, I don’t imagine it’s changed much during its almost 200 years in existence. 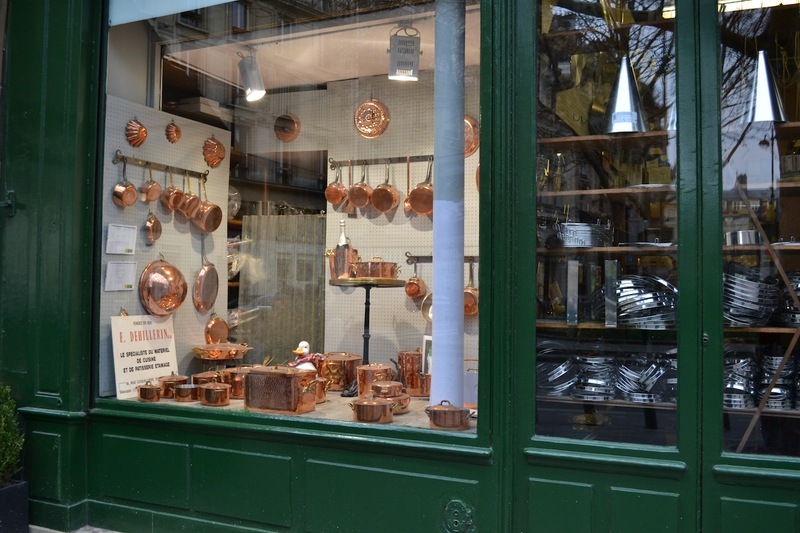 While the outside storefront displays an impressive amount of shiny copper cookware, the inside is dimly lit with pots and pans, molds, and pastry provisions stacked high on dusty wooden shelving. It’s far from Williams-Sonoma perfection and better for it. 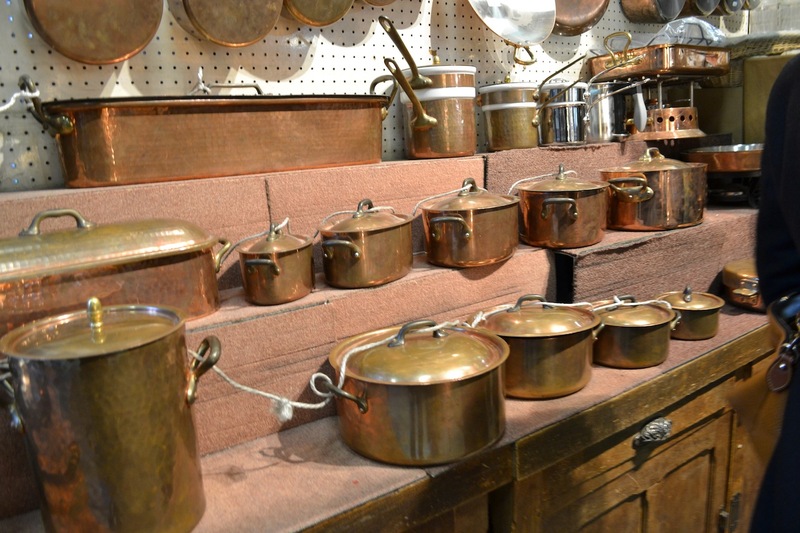 I certainly could find similar items at Amazon or my local Sur La Table, but the discovery of a copper pan and tiny tin barquettes authenticated by a “Made in France” stamp were all the more special for having had to search for them in the cluttered and noisy shop. 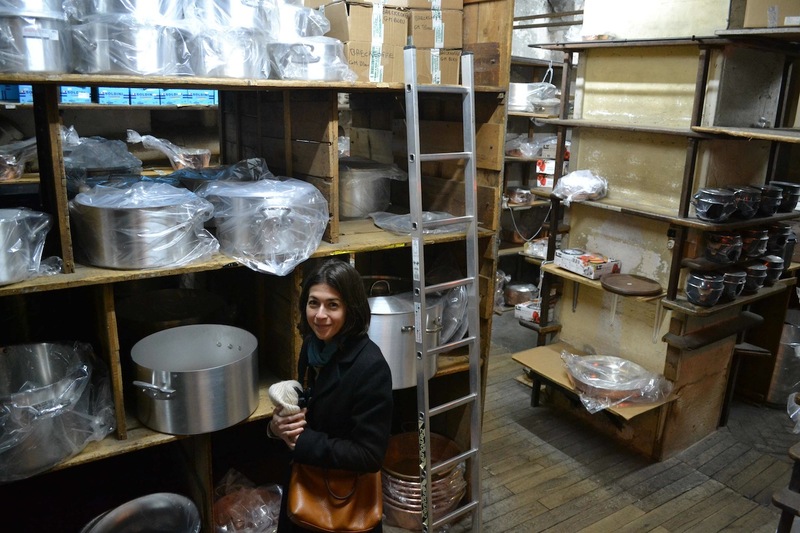 Among the many cookware purchases that my husband kindly lugged home in his suitcase were 12 fluted brioche molds. I’d never made brioche before, but no French bakery lacked the small loaves with their distinctive bubbled top and the molds seemed like a quintessential souvenir. This week, as I prepared for Easter, I decided to give brioche a trial-run. Brioche makes a good choice for a special breakfast as the overnight rest means that most of the work takes place ahead of time. While the process is time-intensive, the final product is worth it both in appearance and taste. My single-serve brioche wouldn’t make a window display in a fine Parisian boulangerie, but the buttery, tender texture was a taste of Paris in my mouth and the golden loaves, still warm from the oven, looked great on my table. 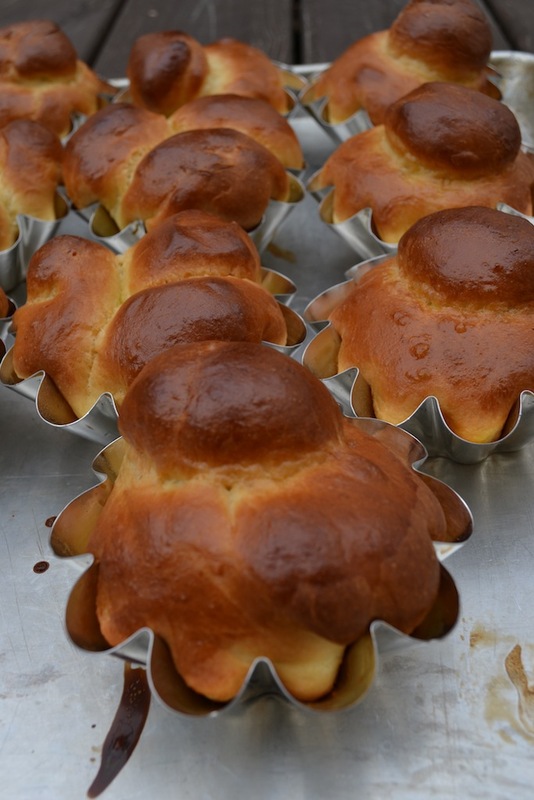 Bake brioche in the traditional manner in fluted molds or bake them in muffin tins. For those who break out in a sweat over the idea of making the topknots fear not. In researching recipes, I stumbled across a neat trick from baking pro Dorie Greenspan of Around My French Table. Having struggled with making the classic tops, she recommends simply dropping three equal rounds of dough into a mold or muffin tin. I gave her technique a try and was pleased by the result. It’s far less stressful and, I found, makes a more consistent final product. Although, despite my far from breathtaking results, I think I would still opt for making the topknot just for the sense of pride I felt when pulling them out of the oven. Brioche are best eaten the same day although I have plans to let a few of mine go stale. Pain perdu, or French toast, is in my future. Happy cooking! 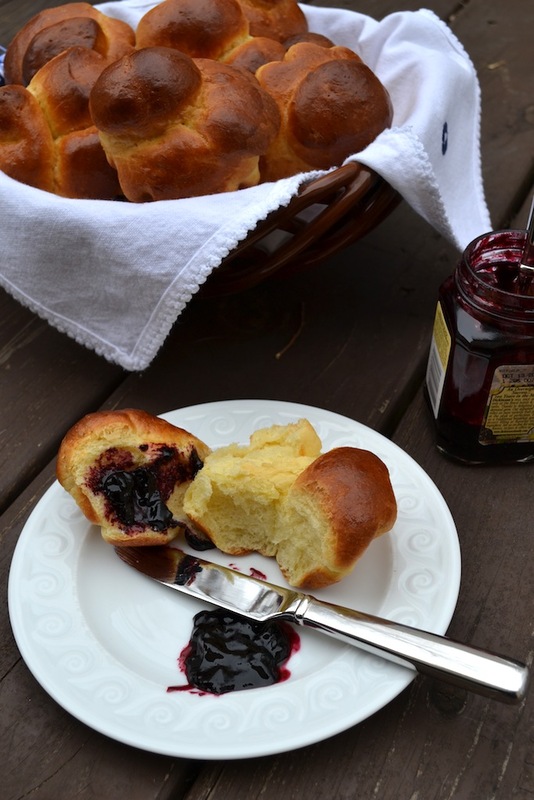 Brioche recipes vary. 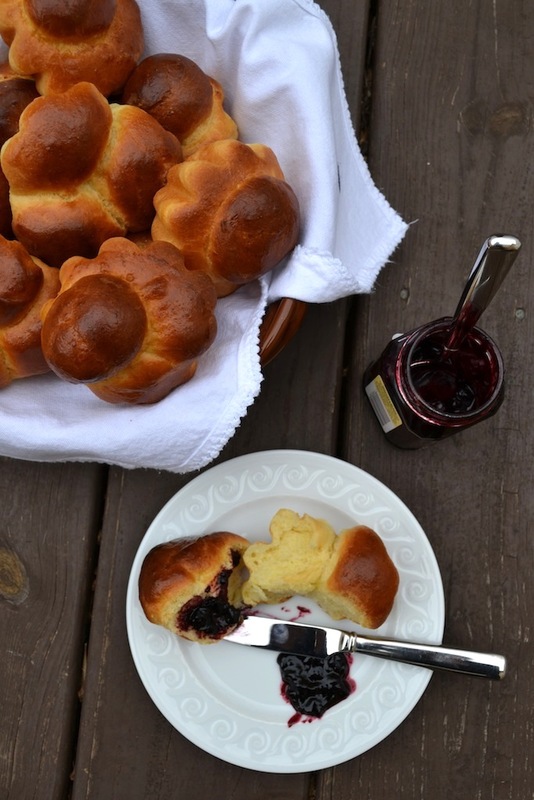 For this recipe, I drew inspiration from recipes for brioche in The Gourmet Cookbook edited by Ruth Reichl and Dorie Greenspan’s Around My French Table. In the large bowl of an electric mixer combine the warm milk and water. Sprinkle the active dry yeast and sugar over the liquids. Stir to combine and then let sit until foamy, about 5 minutes. If the mixture doesn’t foam, the yeast is bad (or your milk and water was too hot). Discard the mixture and start again. In a medium bowl, whisk together the flour, sugar, and salt. Fit the electric mixer with a dough hook. Add the flour mixture to the starter and mix, on medium-low speed, for two minutes until combined. The dough will look dry and crumbly; this is ok.
Keeping the mixer speed at medium-low, add the beaten egg, one-third at a time, beating until just incorporated before adding more. When all the eggs have been added, increase the mixer speed to medium and mix for 3 minutes. Reduce the mixer speed to medium-low and begin adding the softened butter, one tablespoon at a time. Allow the butter to be almost completely incorporated before adding the next piece. Once all the butter has been added, increase the mixer speed to medium-high and beat for about 7 minutes or until the dough starts to climb the dough hook and begins to pull away from the sides of the bowl. The dough will be batter-like, but with a glossy sheen and some elasticity. Grease a large bowl with a little butter and add the dough. Cover with plastic wrap and lay a towel over the top. Place in a warm place and allow the dough to rise for about 1-½ hours or until double in size. Punch down the dough. Cover with plastic wrap and place in the refrigerator. After one hour, punch down the dough again and re-cover with plastic wrap. Let the dough rest in the refrigerator overnight or for at least 8 hours. Brush the fluted brioche molds or 10 large muffin tins with the melted butter. Set aside on a rimmed, metal baking sheet. Remove the dough from the refrigerator and shape into a 10-inch long log. Cut into 10 equal pieces and cover the pieces with plastic wrap. Working with one piece at a time, pull off a small piece of the dough if making traditional brioche. Lightly flour the work surface and roll the small piece of dough as well as the larger piece into round balls. Place the large round of dough in a buttered mold. Dip your thumb in cold water and then press your thumb through the center of the large ball of dough until you reach the bottom of the mold. Pinch one end of the small round of dough into a cone-shape; the small piece of dough will look like an ice cream cone with one scoop of ice cream. Slide the cone shape, round part up, into the hole created by your thumb. Gently press down. Repeat with the remaining pieces. Alternatively, if the steps to making the topknot seem too tricky, divide each piece of dough into three pieces. On a lightly floured surface, roll into round balls and place in a buttered mold or muffin tin ala Dorie Greenspan. Lightly cover the brioche with plastic wrap and let rise in a warm space until doubled in size, about 1-½ hours. Place a rack in the center of the oven and preheat the oven to 400 degrees. In a small bowl, whisk together the egg and milk to form a wash. Gently brush the brioche with the egg wash. Be careful not to let the egg wash drip into the molds as it will prevent the brioche from rising. Place the baking sheet on the center rack and bake for 20 minutes or until golden brown. Check the brioche after 10 minutes to see if they are browning too quickly. If they are, simply place a large piece of foil over the brioche and continue baking for the full 20 minutes. Remove the brioche from the oven and let them rest in their molds for five minutes. Turn them out on a wire rack to finish cooling. Serve with jam and tea or coffee. Thanks for reading, Denise. I am glad that you enjoyed the post and I’m excited that it sounds like you will be trying this at home. I looked up some other recipes and it sounds like you should be able to get 2 (8-inch) loaves from this recipe. Butter two (8-inch) loaf pans. Divide the dough in half and then cut that half into 4 pieces. Roll each piece into a log or a large round ball and then place side by side in each of the loaf pans. Cover and let rise until double in size. Bake at 400 degrees for about 25 -30 minutes (cover with foil if browning too quickly). I plan on making these again soon and will give it a whirl in a loaf pan next time. If you make it before then, let me know how it turns out. Happy cooking and thanks for reading. What a wonderful post! 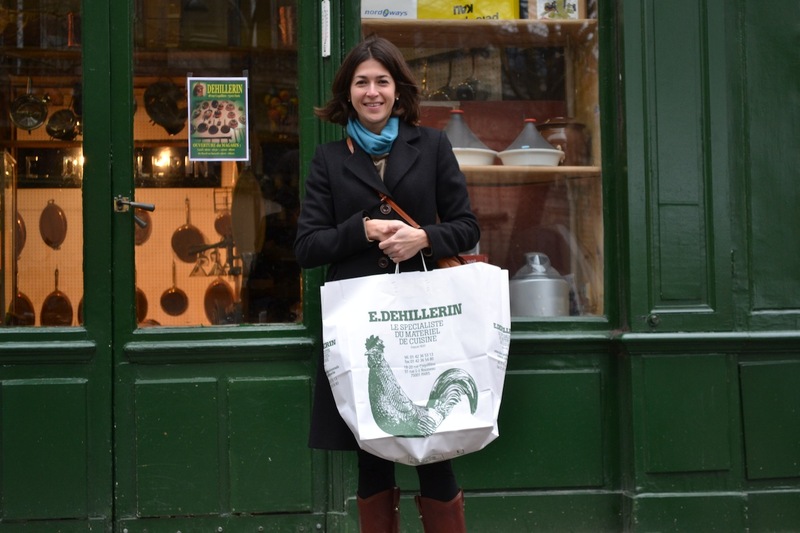 I’m heading to Paris next month and plan on exploring just as you and your husband did – by foot. The best way to discover a city. Will be paying a visit to Dehillerin too! Thanks for sharing. Yum!!! Looks just like the brioche in Paris. And loved the dehellerin! Great post. You are most welcome, Denise! I think a 9 x 13-inch pan would be about right. A square (8 by 8 inch) dish might work (you’d want them to be snug), but I don’t think it would allow enough room for the rise. I’d grease the 9 x 13-inch casserole dish with a little butter and then cut the dough into 12 pieces. I’d roll each of the pieces into a round and place them in the baking dish. Let rise until double in size (about 1 to 2 hours) and then bake. I would use the same temperature (400 degrees) and would bake them for about 20 minutes. If you are using a glass casserole dish, baking time might be a little longer, but I wouldn’t think more than 5 minutes. Happy cooking and send me a pic of how they turn out. Sounds like a yummy variation!